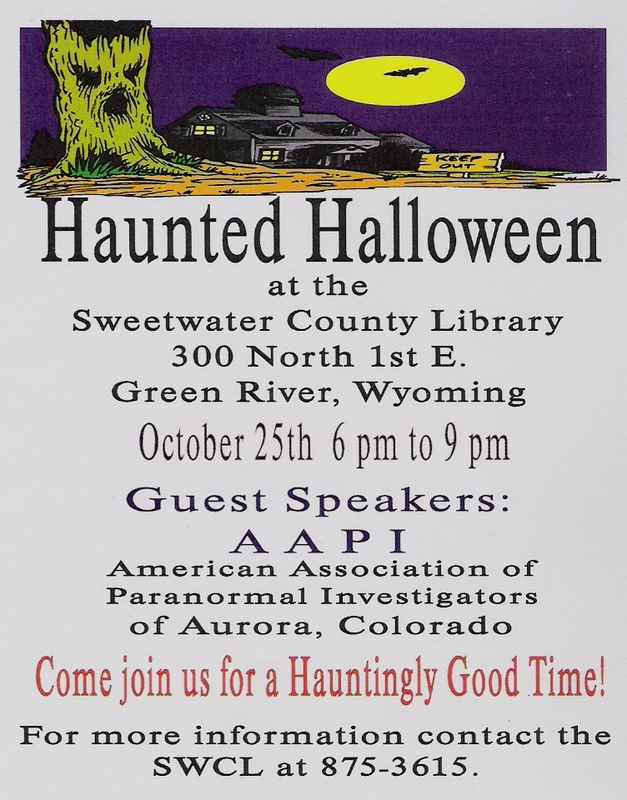 Many of you are awaiting word of the AAPI (American Association of Paranormal Investigators) program and investigation, which was October 25, 2008 at the Sweetwater County Library. Well first let me say, I was very pleased with turn-out. According to our count there were around 140 people that attended the program. For our small area this is big. Thank you to all of you that attended. The staff of AAPI, were happy to see so many of you. Because they are a non-profit organization and have come all this way, from the Denver area, it is nice to see people are interested in what you have to say. The three members of the team that presented are Stephen Weidner, Sharon Raines, and “Turtle” (yes, that is what he is called). Helping with the event were several members of SPIS (Sweetwater Paranormal Investigators), David , R. J., Hannah, and Brad. I would like to send a heartfelt Thank You to all of the AAPI, SPIS, and Sweetwater County Library staff that helped to make this event so successful. The evidence is now being analyzed and will not be available for some time. I have been asked to relay some of my findings, as this was my very first “Ghost Hunt”. I had never been a part of anything like this before and I was excited but apprehensive. One of my sons and I watch “Ghost Hunters” on the Sci-Fi Channel each Wednesday evening. It has become something of a family thing. I always figured that if I worked in a building that is said to be haunted and I maintain the Ghost Log here that I should at least try to educated myself as best I can. I try to understand what the investigators are doing and how they “debunk” the alleged claims. During the presentation given by AAPI, I was please to learn that many of the tools and procedures are similar to what I have learned before. At least I am on the right path. I find that it if important to try to debunk or evaluate the findings, so that you are not just reporting every little thing as “ghostly activity”. Not every noise or item dropping is paranormal. Think about it….most is just common sense. All of us have some intuition. Many cultures are more in-tune to their “inner eye”. For ghost hunting it seems we must use an open mind. We must allow our selves to be more aware of every sense and feeling. If you feel colder for no reason, this is noteworthy. If a cold spot moves and there is no reason, this is noteworthy. All the senses have to be opened up. If you sense there is something there, this I am told is when you want to have an EVP (electronic voice phenomenon) recorder handy. Start asking questions and wait a minute to allow a response, and then continue. We all have questions, we all want to know. AAPI and SPIS have completed their second investigations. Now we must give them time to analyze their findings. I was pleased to be part of the investigation and I hope we will remain in contact for some time. There are a lot of questions and it is good that we have them to go to. I will report to you as soon as the report is made available to me. Recently I was checking out the online library catalog for the Sweetwater County Library System. I check for new DVDs all the time and I ran across the series Paranormal State which is a fairly new television series about Ghost Hunting. Because I work in a haunted library things like this catch my attention. I had heard about this series, but I was only able to catch it on TV once. I was intrigued. The White Mountain Library has the complete first season, in a three disc set. I found this series to very interesting. I watch several of the “ghost hunter” shows on a regular basis. Ryan and his team take their cases very seriously. There is also a definite religious background in their attitudes and believes. Each team member brings their own religious believes with them. There are Catholics, Pagans, etc. Also they use a clinical psychologist to work with the persons from each case if needed. I try to learn from each of the shows and teams that I watch. I myself do not “ghost hunt”, but I do get many questions. It is important to me to be informed, so that I too can help others to understand the unexplained a little better. Paranormal State has definitely given me a better view of some of the things to watch out for. I do not mean that the library in which I work has “evil spirits”, but they definitely educate you in being cautious when dealing with any spirits. I give Paranormal State an A+. Check it out. Delve deep into the strange and the mysterious with Paranormal Research Society founder Ryan Buell and his team of investigators as they attempt to unravel inexplicable paranormal phenomena including sixth-sense experiences, ghost sightings, demonic disturbances, and brushes with the darkest areas of the unknown. Founded by Buell in 2001, the PRS works on cases across the country and is one of the most recognized paranormal societies in the nation. This season includes a Pennsylvania couple besieged by paranormal activity in their home, an aggressive poltergeist in Maryland, and a ghostly hag nicknamed the “Lady Vampire” by the Texas family she torments. Through the use of Electronic Voice Phenomenon (EVP) recordings and video documentation, and with the help of renowned psychics, demonologists, psychologists and counselors, the PRS explores these bizarre cases in the hopes of helping frightened people who have nowhere else to turn. I am proud to announce that the Sweetwater County Library will be hosting a Haunted Halloween program on October 25th 6pm to 9 pm. The guest speakers will be AAPI (American Association of Paranormal Investigators) of Aurora, Colorado. The members of AAPI are Ghost Hunters. Please come by and join us for a great night of the Paranormal Kind!